Take I-94 East and merge onto I-43 North. Take exit 74 towards Locust St, merge onto N 7th St, and turn right onto Locust St. Continue on Locust St until you get to Oakland Ave and make a left; two blocks later turn right onto Kenwood Blvd. Once on Kenwood Blvd drive a block and a half; the UWM Physics building will be on your left. Continue a few more feet and on your left will be the parking lot entrance. Take I-43 South. Take exit 74 towards Locust St, merge onto N 8th St, and turn left at Locust St. Continue on Locust St until you get to Oakland Ave and make a left; two blocks later turn right onto Kenwood Blvd. 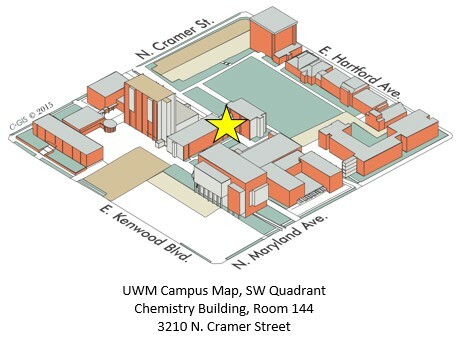 Once on Kenwood Blvd drive a block and a half; the UWM Physics building will be on your left. Continue a few more feet and on your left will be the parking lot entrance. Take I-43 North. Take exit 74 towards Locust St, merge onto N 7th St, and turn right onto Locust St. Continue on Locust St until you get to Oakland Ave and make a left; two blocks later turn right onto Kenwood Blvd. Once on Kenwood Blvd drive a block and a half; the UWM Physics building will be on your left. Continue a few more feet and on your left will be the parking lot entrance. Paid parking is available in the UWM Union Parking Garage (2200 E. Kenwood Blvd). Parking is also available in the garage beneath the Engineering and Mathematical Sciences Building (enter from North Cramer St) or on the street. Free and metered parking is available on Kenwood Blvd, N. Cramer St, N. Murry Ave.
Milwaukee County Transit bus routes 30(via Downer), 21, 22, and 60 stop in front of the Student Union. For more information, please check the Milwaukee County Transit System website. Bike racks are available around the UWM campus. The Oak Leaf Bike Trail passes a few blocks from the Department of Chemistry & Biochemistry main office.